Our new episode pairing will be Kamala Khan’s Ms. Marvel with Carol Danver’s Captain Marvel. And Kamala’s up first! Joining us are the critically charming Merri and Missy from the Fake Geek Girls podcast. Claire begins by discussing the involvement of women in comics as fans and creatives, and explains the factors that have both welcomed and shunned them from the industry. Kyle continues the theme by talking about Marvel’s diversity initiative in 2011. 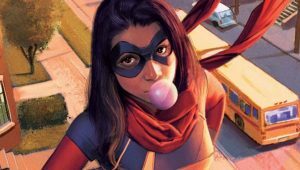 The Fake Geek Girls help us tie it into the creation of Kamala Khan and what characters like her mean for our culture. Our hosts and guests wrap up with their thoughts on the initial run of Samana Amanat, G. Willow Wilson, Adrian Alphona, and Jamie Mckelvie’s Ms. Marvel. Previous 90: Dragon Ball Z Part Two – Becoming Like the Gods	Next 92: Captain Marvel Part Two – The Power of The Carol Corps.